If anything happens on our site that makes you feel uncomfortable or that, in your opinion, clearly does not belong here, please flag it and bring it to our attention! Click the flag link under any post and you will see the pop-up dialog pictured below. Click the flag icon to the left of the comment you want to flag and you will see the pop-up dialog pictured below. What happens when I flag something as spam or abusive? 3 flags -- post is banished from the front page. 6 flags -- post is locked, deleted, and the owner loses 100 reputation. 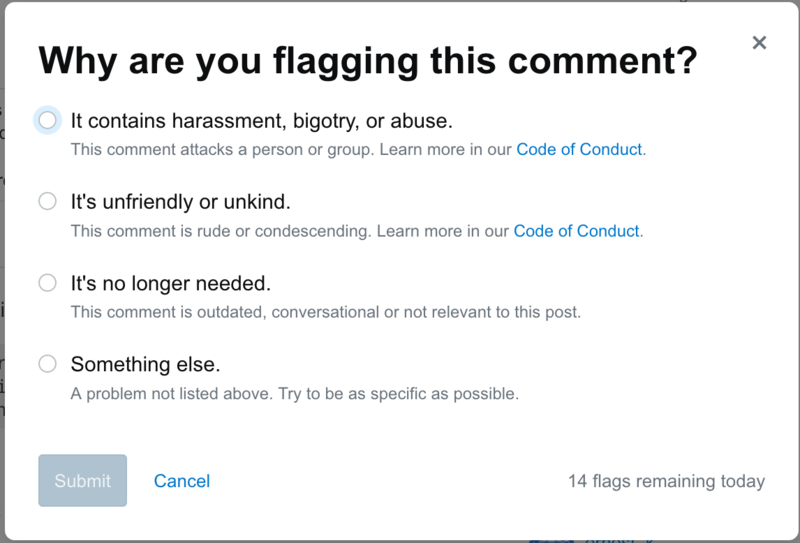 What happens when I flag a comment? 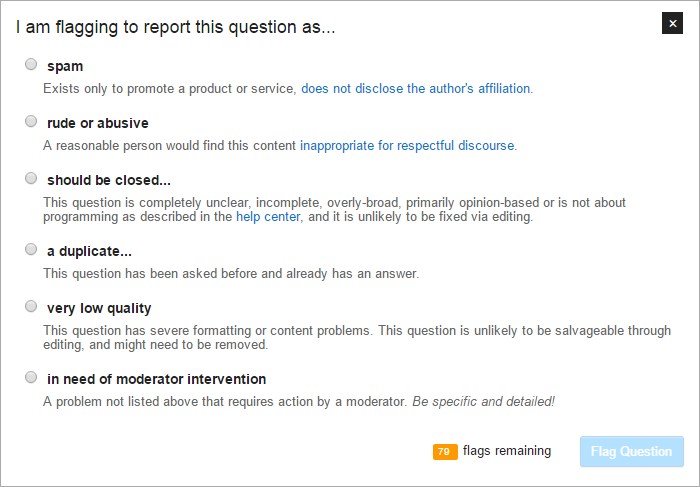 What happens when I flag something as in need of moderator intervention? Is there any way to remove flags? 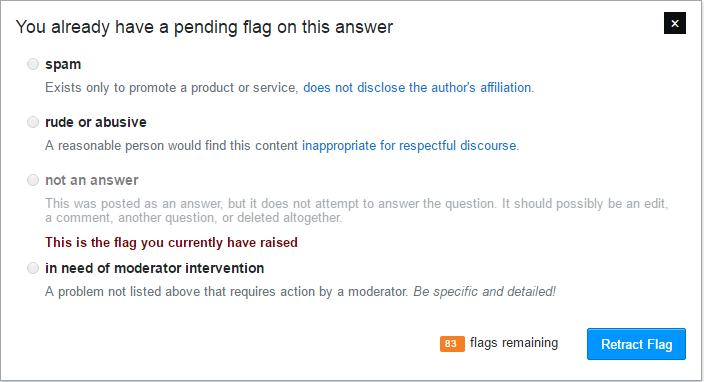 You cannot raise the same type of flag twice on a post: for example, if you retract a "spam" flag, you won't be able to raise a spam flag or an abusive flag in the future. 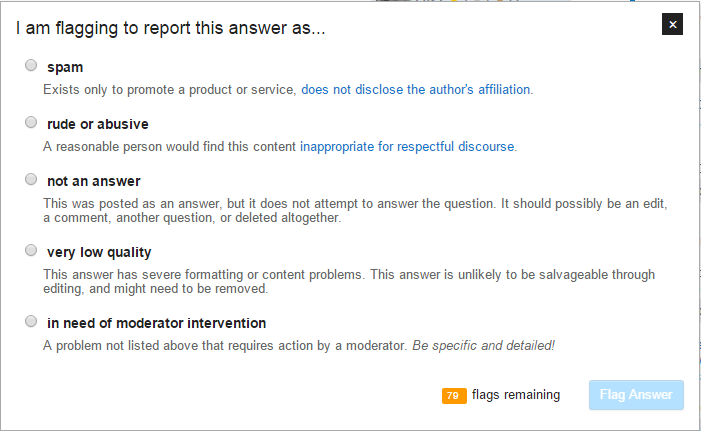 Many flags are handled by other members of the site like yourself, who've earned review privileges. Close flags, Not an Answer, and Very Low Quality are primarily handled this way. You can view the outcome of your past flags at any time by clicking on "helpful flags" in your profile. You get one bonus flag per 2000 reputation. You are awarded additional bonus flags when you flag correctly - one bonus flag for every ten net helpful flags (helpful flags minus declined flags).